Emotional abuse may be referred to as psychological violence or mental abuse, which involves subjecting someone to behaviour which may result in psychological distress or trauma such as chronic depression, stress, anxiety and post-traumatic stress disorder. Emotional abuse can be just as devastating as physical abuse, sometimes even more so. How do you know if you are being emotionally abused? The answer is in the way a person makes you feel as a result of their behaviour. If someone controls your life, puts you down and creates feelings of low self-worth, you are being abused. 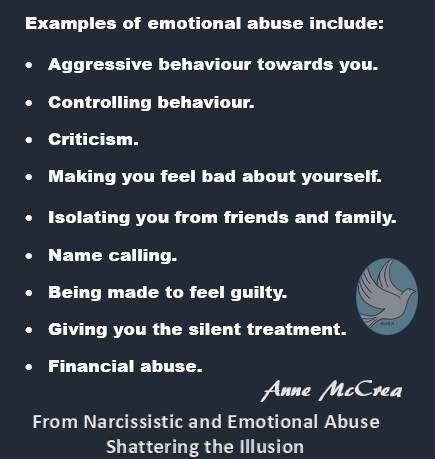 If someone is stopping you from being yourself, expressing yourself or isolating you from your friends and family, you are being emotionally abused. • Aggressive behaviour towards you. • Controlling behaviour, such as telling you what is best for you, not being allowed to have your own opinions, being told what to do, how to spend your time, who to associate with, what to wear etc. • Being belittled and made to feel bad about yourself. • Being made to feel guilty for mistakes you didn’t make. • Financial abuse such as not being in control of your own finances. Denying access to finances will restrict your freedom and independence. The aim of an emotional abuser is to gradually chip away at your self-esteem and independence so that, in time, you become a shell of your former self. Eventually, you may feel trapped with no way out of the relationship. You may feel that you can’t manage without this abusive person in your life. You can, and you will with the correct help and support. I think my bf is abusing me. Very hot and cold towards me. Tells me I have serious issues and that I’m over the top needy. That I’m a baby. No man wants a person like me and I’ll always fail at relationships. But then keeps me hidden from his friends and not to let anyone know on social media we’re a couple. Told me after I put my dong down that I’m over the top emotional and to get over 5 hours after she died..
Yep, my ex did the same thing. Those are all red flags. I just got out of a all night fight with my husband and the hardest thing is watching as he plays every violin and twist all his lies and and does everything in his power to push me to his desired state to the brink of a break down. As if I don’t know how this works. I see him. I see through him and yet I can’t do anything about. The tears are from the frustration of knowing and he won’t stop.